While mid to late spring is the busiest time of the year for most gardeners, there are a variety of chores that I reserve strictly for winter… here is the Garden Calendar for January. If there is a good thaw in January, check all the perennial or shrubby herbs and vegetables wintering in your garden. If the soil is dry, water slowly and deeply. Your local delicatessen often has surplus 4- to 5-gallon, plastic, pickle buckets — a good size for growing containerized plants, or pick up inexpensive, plastic buckets at your local paint store. Remember to drill several quarter-inch holes in the bottom of these containers for drainage. Also, plastic buckets can be painted. Do some reading on trickle irrigation this winter. Installing a trickle system will save you time and water and increase your garden yield. Overhaul your garden sprayer. Inspect leather washers and the plunger and replace any worn parts after thoroughly oiling new leather. It may be difficult to locate exact parts for your sprayer model. By starting now, you’ll have them by gardening season. Now is a good time to take advantage of off-season specials on garden tillers or attachments. To clean crusty clay pots, soak them in vinegar to help remove salt deposits. Soaking in a dilute solution of bleach (1 part bleach to 9 parts water) will kill micro-organisms. We do not recommend combining any household chemicals for cleaning purposes, so complete the cleaning in two steps. For heavily crusted pots, scrub with a steel wool pad after soaking for 12 hours. If you have some time this winter, paint the handles of garden tools red or orange. This will preserve the wood and make the tools easier to locate next summer when you lay them down in the garden or on the lawn. Move garden ornaments, such as urns or jars, into the garage or basement to prevent damage during the cold winter season. If containers are too large to move, cover them to prevent water collecting in them or turn them upside down during the winter so water will not collect and freeze in them causing breakage. Make your own biodegradable seedling pots from newspapers. For a 3-inch pot, cut a three-layer-thick section of newspaper into a 9-inch square. Divide the paper into nine equal squares, either with a pen or by folding layers into thirds, unfolding them and folding into thirds the other way. Make a cut from along one of the fold lines in each of the four corners to the fold that marks the center square. Bend the flaps up, overlap and staple them and the seedling pot is ready. The pots can be planted in the garden when the seedlings are ready to set out. Another method for making biodegradable pots is to cut strips of heavy paper such as grocery bags to match the height and diameter of the pot you want. For example, a 2-inch -quare pot would require a strip 2 inches wide and 8 inches long. Add approximately 1 inch to the length for overlap. Glue the strips in circles to form a bottomless pot. Fit these into a wooden or plastic flat with sufficiently high sides to give good support and fill them with soil. Your wheelbarrow can support its own load if you add two small wheels to the rear legs. Anchor a bar to each leg with a “U” screw and bolts. Attach the wheels to the ends of the bar with a bolt and washer on both the outside and inside of the wheel. Modifying a wheelbarrow like this cuts down on the strain of lifting heavy loads by letting you push the wheelbarrow. Add garden record keeping to the list of New Year’s resolutions. Make a note of which varieties of flowers and vegetables do best and which do poorly in your garden. Tired of all the lame wilted lettuce flown in from who knows where at the grocery store? Grow your own winter salad! Record those items you wished you had this year (dried flowers, herbs, pickles and preserves) and make sure while doing your garden plan, you plant appropriate plants for next year’s harvest. If you have heavy soil now is the time to dig over the plot, once the soil is turned over the winter frost can penetrate the large lumps and break down the soil into a fine tilth. This will considerably ease your task at planting time. 8 -12 inches. Stunted plants will benefit from heavy application of compost tea in the spring. Make a note on your spring schedule to do this. Take care, over fertilization can stimulate stem and leaf growth, increase risk of disease, and prevent fruiting. Remove hazardous or storm damaged branches. Save major pruning for late winter when you can correct winter damage and do structural pruning at the same time. Make sure all your animal fencing is still intact and effective. Winter mulch helps protect plants from fluctuating temperatures. Nature provides the best mulch, snow for many areas. If this natural mulch is not as common in your area as is needed, use staw or hay, the next to perfect mulch! Seeds of celery, celeriac, sweet Spanish onion, parsley, anise, fibrous rooted begonia, snap-dragon, verbena, geranium, and petunia can be sown indoors now for transplanting outdoors later in the spring. Add variety to your perennial border by planting some single or Japanese peonies. Flowers of these peonies are held erect on stiff stems and are more resistant to damage by wind and rain than the double varieties. Also, they make attractive, long-lasting cut flowers. Coarse materials, such as corn stalks and evergreen boughs, can be used to mulch chrysanthemums when extra protection is needed during cold winter. This is a great use for left-over Christmas tree branches. Consider using ferns in your home landscape. Maidenhair, sensitive, cinnamon, and Christmas ferns are good choices, especially for shady nooks. These ferns need an even supply of water throughout the growing season, so soil with a high humus content is ideal since it retains water. Reiger begonias are popular house plants that flower more or less continually. Their flowers resemble those of wax begonias except in size and variety of color; Reiger begonia flowers are about twice as large and come in shades of red, pink, salmon, orange, and yellow. After several months of flowering indoors, they may need their long stems cut back. New growth will emerge soon, and flowering begins again in three to four months. When terrarium plants become overgrown, it is best to discard them and start a new terrarium. Empty the container and wash it in hot, soapy water. When replanting, use fresh, sterilized soil and new, healthy plants. Gerbera seed started in January will bloom in June. Grow in full sun, providing ample moisture. Pot up a few in fall and grow in a cool, sunny window over winter. Geranium seeds may germinate irregularly, so take care transplanting from your seed tray until germination is complete. Do not pinch back seedling geranium plants. Pinching for shaping purposes can create a plant that looks good, but won’t flower until very late in the season. To ensure bushy plants, provide bright light. A pot of Hens and Chicks (Sempervivum spp.) can liven up winter patios. These hardy succulents can remain outdoors year round and are especially prolific when placed in clay strawberry pots. Winter color can range from green to a pink or purple cast. On warm days, check to see if any perennials have been heaved by freezing and thawing of soil. Firmly press down any that have lifted and cover with at least 2 inches of organic mulch. Plan herbaceous flower beds now. Changes can be made early in the spring. Many perennials will need to be divided. Arrange to trade with friends and neighbors. Designate locations in the bed for summer-flowering annuals to supply color between spring-blooming perennials and fall chrysanthemums. In warmer areas, tuberous begonias and caladiums can be started indoors now. In mountain areas, start next month. Set root starts in pots or shallow boxes of rich soil (1/3 sand, 1/3 peat, 1/3 loam). Cover with 1 inch of the mixture. Keep the pots moist, not wet, and in good light at 65 F. Transplant to larger pots in 6 weeks and set outside in the ground after all danger of frost. If a few, consecutive, warm days have caused your bulbs to nose out from under protective mulch, plan to thicken the mulch layer as soon as cold weather returns to prevent freezing by exposure. Start ageratum, baby’s breath, begonia, statice, pansy, sweet pea and snapdragon seed indoors this month or next. Provide plenty of light. Start seeds of these and other slow-developing flowers in January or February: alyssum, coleus, dusty miller, geraniums, impatiens, marigolds, perennials, petunias, phlox, portulaca, salvia, vinca and verbena. Check perennials to see if any have been pushed out of the ground by alternate freezing and thawing weather. If so, push them back into the soil; otherwise the exposed roots will dry out and die. Replace mulch if it has blown away. Not need to water the lawn this month, the ground is cold, frozen, or covered with snow. The grass is dormant. Do not fertilize. Applying fertilizer to frozen soil can pollute the water. Melting snow and winter rains wash the fertilizer off the soil surface into surrounding storm sewers, rivers, and lakes. If your house foundation is not exposed, you do not need plant materials right up against it. Your house will look larger if a shrub or ground cover is planted in only one or two places between the corner and the front door. Dried, crushed shells from shrimp, crabs, and lobsters can be sprinkled on the soil to enrich it with calcium. A fertilizer made from crab shell wastes is already on the market. Plan to attend the garden and landscape meetings and clinics arranged by the Extension agents in your county or city. The latest and best gardening information will be presented. For easier lawn maintenance, eliminate the hard to mow spaces. Eliminate acute angles in beds and borders. Combine single trees or shrubs into a large planting connected with ground covers. Put bird baths in flower beds or surround them with ground covers. Avoid heavy traffic on dormant lawns. Dry grass is easily broken and the crown of the plant may be severely damaged or killed. Be sure charcoal chunks are removed before wood ashes are applied to lawns. Do-it-yourself landscaping projects are very popular these days and provide savings in more ways than most people realize. They enhance property value and can reduce the cost of heating and cooling bills. Doing it yourself saves the actual out-of-pocket expense of contracting and provides indirect savings on taxes. Finally, home landscaping is great preventative therapy and improves one’s mental health. Examine the limb structure of your shade trees. Remove dead,diseased, and storm-damaged branches. If left on the tree, these weakened limbs can cause damage by falling on buildings or passers-by. For a unified look in the landscape, construction materials and plant materials should be harmonious. Coarse-textured plants, such as rhododendrons, go better with cut stone, rock, and rustic materials. Finished woodwork and brick work well with fine-to medium-textured landscape materials, such as astilbe or artemisia. If grown in good garden soil with adequate drainage, yews will grow in shade, withstand almost any exposure, and resist most pests. Direct sunlight and strong winds may injure foliage in winter in the colder regions, as will the summer heat in a tidewater area. Keep yews well watered to avoid winter browning of foliage. Looking for plants suitable for containers with roots capable of withstanding very cold winter temperatures? Try wintercreeper, white spruce, shrubby cinquefoil, yews, English ivy ‘Baltica,’ Vinca minor, creeping and shore junipers. During the short days of winter, landscape ornamentals with striking silhouettes draw attention. Try corkscrew willow, kousa dogwood, weeping cherry, and ornamental grasses. Consider placing one of these where it can be seen from a west window at dusk. Winter is the time to apply miscible oil sprays to kill overwintering mites, aphids, and scale on deciduous trees and shrubs. Spray miscible oils when temperatures are above 40 F, but not within 24 hours of a freeze. Because the oil kills insects by suffocation, avoid spraying on windy days to ensure that all surfaces of the plant are covered. Tree branches that cast excess shade over herbaceous flower beds should be removed in winter when they will not damage the bed as they fall. In the colder parts of the state, construct wind breaks around plants predisposed to winter damage, such as broad-leaved evergreens. Drive four wood stakes around the plant, wrap with burlap, and staple at each corner. Consider moving these plants to a more protected site in the coming months. 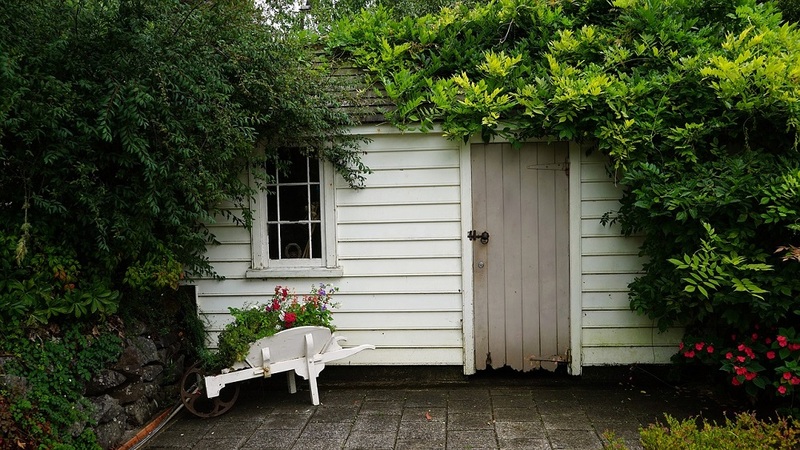 For added security around the home, plant thorny shrubs on property lines and under windows. Some very thorny ones to consider include pyracantha, tri-foliate orange, Rosa rugosa, and thorny elaeagnus. Order plants now for late-winter planting. Look at your landscape. Do you need evergreens to protect your privacy, reduce street noise, block the glare of street lights? Order plants in January and February for March planting. When pruning large limbs, always undercut first. This means to cut from the bottom up, one-third of the way through the limb, then finish by cutting from the top. The undercut keeps the limb from splitting and breaking off, which could damage the trunk and become an entryway for insects and diseases. Do not cut flush to the trunk, the collar or enlarged base of a branch produces hormones that help heal wounds. Research shows that a pot-in-a-pot set-up for irrigating houseplants is better than capillary action through water wicks. By using a small, unglazed clay pot placed inside a larger, glazed clay pot with a water reservoir in between, plants are better irrigated, and have higher visual quality, greater plant leaf area, and improved root growth. Although tomatoes, peppers and eggplants self-pollinate, to insure ample fruit set in home greenhouses, take a cotton swab or a fine paintbrush and transfer the pollen from one flower to another. Swirl the swab or brush lightly inside each flower, one after the other. Repeat this process the next day. Don’t wait too long after the blossoms appear to pollinate them. For most plants, the most successful pollinating can be done the day after blossoms open. If successful, you will be able to see tiny fruits as the flowers wilt. To prolong bloom, protect poinsettias from drafts and keep them moderately moist. Turn and prune house plants regularly to keep them shapely. Pinch back new growth to promote bushy plants. Check all house plants closely for insect infestations. Quarantine gift plants until you determine that they aren’t harboring any pests. Overwatering indoor plants encourages root rot. Water when the soil is dry to the touch. Keep winter fertilization of most houseplants to a minimum as plant growth is now at its slowest. House plants and holiday gift plants should not be placed on top of the television. This location is too warm and in most homes too far from windows to provide adequate light. Thin-leaved plants are very sensitive to transplant shock. If a plant wilts after repotting, encase the entire plant in a plastic bag. Twist the bag shut and punch two or three holes in it. Allow the plant to recuperate out of direct sunlight in this protected environment for two or three days. Resist the urge to water a wilted plant if the soil is moist. The low light levels of winter call for some adjustments in the placement of houseplants. Bring house plants that normally thrive on the north side of the house to east windows, while allowing the plants from the east more sun on the south. Also, give the plants that usually are set on the tables away from direct light a short midwinter visit to one of the less-exposed windowsills. When extremely cold nights prevail, draw the window shades or slip lengths of protective cardboard between plants and the glass. Move the most tender plants away from the window panes on the coldest nights. If you potted bulbs of daffodils, crocus, tulips, or hyacinths in the fall, bring them indoors now to force them into bloom. Place pots in a cool window that receives direct sunlight for at least a few hours each day. Allow soil to dry partially between each watering. Fluorescent tubes lose intensity with age. If you are using quite a few fluorescent lamps, change a few tubes at a time to avoid plant damage by the sudden increase in light intensity. If you are considering installing supplemental lighting for your indoor plants, the 48-inch, 40-watt fixture with two fluorescent tubes is the industry standard. Spare parts are readily available and high production volume assures lower costs for 48 inch than for other size tubes. Use one cool white and one warm white tube to obtain a light mix most beneficial to plants. When dusting the furniture also consider dusting the plants. With the short days of winter, light reduction must remain at a minimum. Wipe dust from broad-leaf plants at regular intervals using a cloth dampened with clear water. Give your holiday gift plants the best care so they can retain their original, attractive appearance. Keep them cool with a temperature of 70 degrees F during the day and 60 degrees at night. Set the pots on a tray of moistened gravel to maintain higher humidity. During the winter, most houses are too dry for house plants. Humidity can be increased by placing plants on trays lined with pebbles and filled with water to within one half inch of the base of the pot. If you heat with wood, keep a pot of water on the stove. The added moisture will be healthier for you as well as your plants. Force pips of lily-of-the-valley into flower; approximately three weeks at 60 to 70 degrees F are required. Plants grown under lights need a nightly rest. An automatic timer is ideal to turn the lights off at night. Maidenhair ferns need high humidity (at least 50 percent) so they are ideal for cultivation in terrariums. Hold cacti with kitchen tongs as you re-pot them and you won’t get stickers in your fingers. House plants with large leaves and smooth foliage(philodendrons, dracaena, rubber plant, etc.) benefit if their leaves are washed at intervals to remove dust and grime, helping keep the leaf pores open. Transporting house plants this time of year without protection for even “just a few minutes” can be detrimental. Wrap plants with 3 or 4 layers of newspaper or paper sleeves and staple the newspaper shut over the foliage. Spider plants (Chlorophytum comosum) need to be mature and to have short days (8 hours or less of light) to produce flower stalks, the runners on which the plantlets form. Leaf tip burn of spider plants can be caused by soluble salts build-up due to improper watering and too much fertilizer. Never allow the plant to dry out excessively; and when you do water, water thoroughly from the surface allowing plenty of water to drain out. Amaryllis bulbs may not bloom if they are in too large of a pot. There should be no more than 1 inch of space on each side of the bulb. At least one third of the bulb should be above the soil line. Always cut off the faded flowers of your amaryllis so no seeds form. Producing seeds robs the bulb of strength that should go to next years flowers. To insure next year’s flowers on amaryllis, keep the plant growing strongly until mid-July before allowing it to go dormant. Very few conifers have been studied for potential use as house plants. For many years, the Norfolk Island pine (Araucaria heterophylla) and the Australian bunya-bunya (A. bidwillii) have been the only needled evergreens commonly suggested for growing indoors. Several cypresses, however, are proving equally good in home environments. Two are already appearing in plant shops. The columnar Italian cypress (Cypressus sempervirens ‘Stricta’) is a graceful, very narrow tree, probably the most narrow and rigidly upright of all conifers. The other, C. macrocarpa ‘Goldcrest,’ a cultivar of the Monterey cypress native to California, is widely grown there and in Europe in coastal gardens as specimens, hedges, windbreaks and topiary. Both these plants are hardy only to about 10 degrees F, so they are grown outdoors only in warm climates. The brilliant and velvety flowers of cineraria are shaped like daisies and come in shades of purple, red and blue. It is a plant that will flower brightly, but should be discarded when its show is past. Potted cineraria will last best in a cool, sunny window. The Chinese evergreen is a foliage plant that will survive even in a dark, basement apartment. Its silver-splashed leaves will grow well at very low light levels and it takes a minimum of care, as long as night temperatures don’t drop much below 65 degrees F.
Allow cacti to go semi-dormant in the winter. Water only to avoid shriveling. Place in full sun with a maximum day temperature of 65 degrees F. and a night temperature of 40 to 50 degrees F.
Philodendron ‘Red Venus’ has uniquely shaped leaves with pronounced lobes that are distinctly hooked. The color, reddish to rich green with mahogany-colored petioles, adds to the overall beauty of the plant. In an 8-inch pot, this plant reaches a height of 18 inches with a spread of 24 inches. Ask your local nurseryman or florist to stock this special plant. Take time now to relax and read all of those horticultural magazines and garden books that were put aside during the busy holiday season. Draw a map of your garden and make copies of it. Beds stay in the same place year after year, but the crops rotate each year. To plan this year’s garden, take a clean copy of the map and fill it in. Use the back of the plan to record notes. Keep each year’s plan in a three-ring binder for easy cross-checking of varieties, rotations, etc. If you are spreading the ashes from your wood burning stove in your garden, be aware that, over time, you are raising the pH of your soil. Have your soil pH tested before applying any more wood ashes. When starting seed, cover the flat with a clear plastic wrap to keep the seeds warm and moist. Professional growers use bottom heat to speed germination, but you can get the same effect by placing flats on top of the refrigerator. As soon as seedlings are up, place the flat under lights to keep the seedlings from getting spindly. Light from a windowsill in January or February is often not strong enough to keep seedlings short and sturdy. Supplement natural lighting with a 4-foot fluorescent fixture with three cool- white and one warm-white light tubes about 6 to 10 inches over the flats. Fertilizer (one-quarter to one-half strength) can be applied once every two weeks. One way to file seeds as they come in the mail is to use index card tabs to divide a cardboard file box into categories for each vegetable or flower. As new seeds arrive, place them alphabetically in the proper slot — tomatoes, carrots, etc. Drop notes into the file to remind yourself what is on order to avoid duplication. Digging or drilling holes throughout the root zone and partially filling them with fertilizer is not effective, as most of the feeder roots of a tree or shrub are in the upper layer of soil, and drilling puts the fertilizer below the level of the feeder roots. train the vine up the pole. To water the vine, moisten the sphagnum. This also helps anchor the plant to the pole. To make economical “sticky stakes” for trapping whiteflies and aphids, cut bright-yellow cardboard or plastic, such as recycled detergent bottles or margarine tubs, into strips. Coat with petroleum jelly. Insert into pots or hang near problem areas. Seeds stored under warm, moist conditions deteriorates rapidly. Unless you are sure your seeds were stored under cool, dry conditions, it is safer to buy new packets each season. Fear of failure, more than any other reason, keeps non-gardeners from planting their first garden seed or seedling according to the National Garden Bureau. New gardeners need encouragement and praise from friends, never criticism of their first attempts. As you peruse seed catalogs, choose disease-resistant varieties. They not only make gardening easier, they reduce expenses and environmental pollution from pesticides. In Europe, cut foliage is no longer used just as “filler” for flower arrangements. Greenery arrangements devoid of flowers are becoming very popular. Experiment with the look in your home. Some species to consider are dracena, holly, blue spruce, pine. Wood ashes will raise soil pH. Use them only if the pH is under 7.0 based on a soil test. The safe rate of wood ash application to lawn or gardens is 15 to 20 lbs. per 1000 square feet per year (approximately a 5 gal. pail.) Remember, a little wood ash is beneficial, but a lot is not. Spend a cozy evening in front of the fire going through seed catalogs to decide what you are going to plant in this year’s garden. Don’t wait until late in the winter to order seed. Many varieties sell out early. A fun, indoor project is building bird boxes for the upcoming nesting season. These can be elaborate or simple; consult your local Extension office for easy do-it-yourself plans. There are many prescriptions to keep deer from nibbling ornamentals: fencing, plastic netting, repellents, sprays, hot pepper sauce, egg whites, human hair, lion or tiger manure, and even rock music. Try a few to find out what works for your uninvited pruners. One solution to the deer problem found effective in Louisiana is rotten eggs. A mixture of 12 to 18 eggs in 5 gallons of water sprayed over an acre emits enough odor to repel deer, but not offend the gardener. Save plastic mesh bags in which oranges usually come; they make ideal storage sacks for air drying gourds, bulbs, and herbs. Take down all those Christmas greens before they lose the freshness that made them so attractive during the holidays. Recycle your holiday decorations. Greenery used in ornaments can be used again in the garden. Wreaths and branches stripped from Christmas trees make excellent mulch for protecting newly planted ornamentals. Remove the material in the spring and compost it. The pH scale ranges from 1 to 14, with 7 being the point at which soil has a neutral reaction. The majority of ornamental plants, including grasses and vegetables, grow in soils which have a slightly acid reaction, with a pH of 6.0 to 6.5. One exception is the ericaceous plants which include azaleas,rhododendrons, andromedas, and blueberries. They require a more acid soil with a pH of 4.5 to 5.5.